To improve the lives of those with disabilities now and for eternity. To empower our clients and staff to discover and live out their God-given purpose by knowing, loving and serving God. 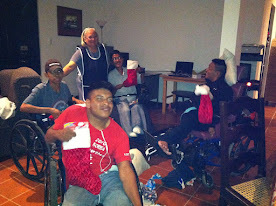 Causa de Esperanza serves as an umbrella association to provide support and leadership to the various aspects of ministry to the disabled begun in 2010 by Pat Duff. The work here in Guatemala has expanded since Pat began her individual ministry and the new association of Causa de Esperanza better reflects the diversity of areas in which we serve. It also emphasizes the team strategy we employ in ministry, having paid Guatemalan staff as well as short-term North American volunteers. In the United States, educational and support services for the disabled are readily available--even taken for granted. Sadly, this is not the case in many parts of the world, including Guatemala. The Josiah Foundation is a recognized 501 (c) (3) organization in the State of Nebraska. All donations through the Foundation are tax-deductible. Contributions are solicited with the understanding that the Josiah Foundation has complete discretion and control over the use of all donated funds. The Foundation has been completely supporting the ministry of Causa de Esperanza since we began working in Guatemala in 2010.